A bridge (saïkama or setu) is a structure allowing persons or vehicles to proceed over obstacles like rivers, valleys or gorges. The Buddha mentioned building bridges for the public good as an example of a meritorious deed (S.I,33). In the Kulàvaka Jàtaka, the Bodhisattva is depicted as a civic-minded villager who removes large stones from the surrounding roads, cuts down trees that might break wagon or chariot axles and who constructs bridges, watering places and rest houses for the convenience of travellers (Ja.I,199). The Tipiñaka mentions a bamboo bridge and what it calls ‘a reliable bridge’ which the commentary defines as one strong enough for a caravan, elephants or horses to cross (Th.7; Vin.I,106). As crossing a river is frequently used as a metaphor for the spiritual endeavour in the Tipitaka, building bridges, paying for their construction or repairing them seems to have had a particular attraction for early Buddhists. A dozen or so Mahayana såtras mention the virtues of building bridges. The Sarvagunapunyakshetra Sutra, for example, mentions seven ‘fields of merit’, the fourth of these being ‘maintaining ferries to help people cross rivers’ and the fifth ‘constructing bridges so that the ill and weak can cross rivers’. As Buddhism spread it took this expression of practical kindness with it. The Cålavamsa, one of the Buddhist chronicles of Sri Lanka, does not mention any monks building bridges, but it does record several kings who did so out of religious motives. Vijayaràjasãha, for example,`had stone bridges put up where water made the road impassable, for the comfort of those coming and going'. The chronicle also gives the dimensions of several large and strong bridges constructed by King Devappatiràja. 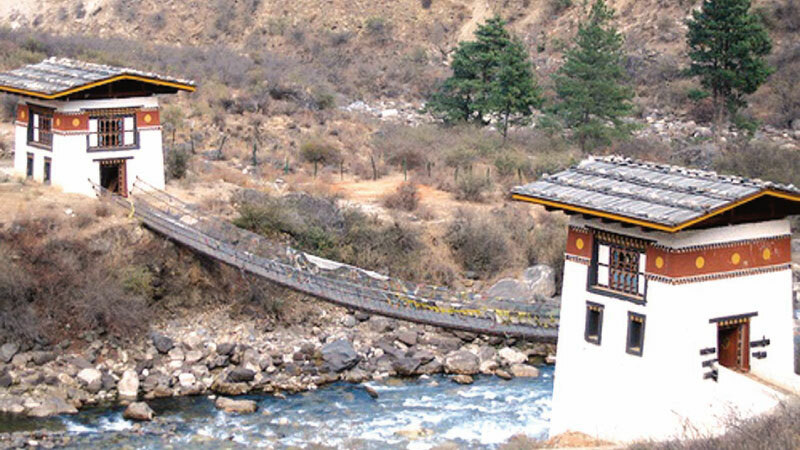 The versatile genius Thangtong Gyalpo (1385-1464) built over 50 chain suspension bridges throughout Tibet and Bhutan. Several of his bridges were still in use until the middle of the 20th century. Records show that building bridges as a religious practice became very popular in China and Japan. The ‘Technical Skills' section of the History of Song, mentions a monk named Huaibing who constructed a pontoon bridge moored by eight anchors. Another work, the Sichuan tongzhi, reports a monk saying: ‘At first I thought that the greatest source of merit came from carving wooden statues and clay images of the Buddha. But one day I realized that the true ßladder and boat of meritû was to help other people and other beings.’ After this, the monk embarked on a program of bridge building. Chinese sources referring to bridge construction by monks or lay people frequently mention that they did it out of ‘pity for the difficulties of the people’ or out of compassion ‘for people who drowned in boats attempting to cross the river.’ The Japanese monk Dºshº (629-700) was famous as a road, dam and bridge engineer. One of Japan’s most famous pre-modern bridges, the elegant Spectacle Bridge in Nagasaki, was designed and built by the monk Mokusunyoujo in 1634. This innovative structure was the first stone-arched bridge in Japan and is still in use today. It was given its name because when its two arches are reflected in the water it looks like a pair of spectacles.